When I moved back to Florida, I sort of romanticized Chicago winters in my head. The snow dusting the city in a blanket of white. Cartoon-like fluffy flakes drifting downward. The mounds of comfort food I allowed myself to gorge on while working from home under an soft microfiber blanket. ...And then we moved back here. Not to say that I don’t love winter (which I really do, I promise), but there's been a bit of a reality check in the last 24 hours. Last night, we had our first really big snow storm since we’ve moved back. It wasn’t this winter wonderland fantasy I had in my head, but rather the slushy gray snow and salt covered streets I guess I had blocked out. Nearly slipping and falling a few times in my high-heeled boots, I trudged through heavily snow covered overpass and down to the Blue Line Grand stop only to find that the trains had been delayed at 5:10 pm. Serves me right trying to go home right at 5 o’clock. After 3 trains passed with cars filled to brim with commuters, I decided to actually travel the opposite direction to get on before the bulk of other people get on. Well, my plan fell through as more and more people packed on to the platform. Needless to say, an hour and a half later I arrived in Logan Square cold, wet, and ready for some comfort food. 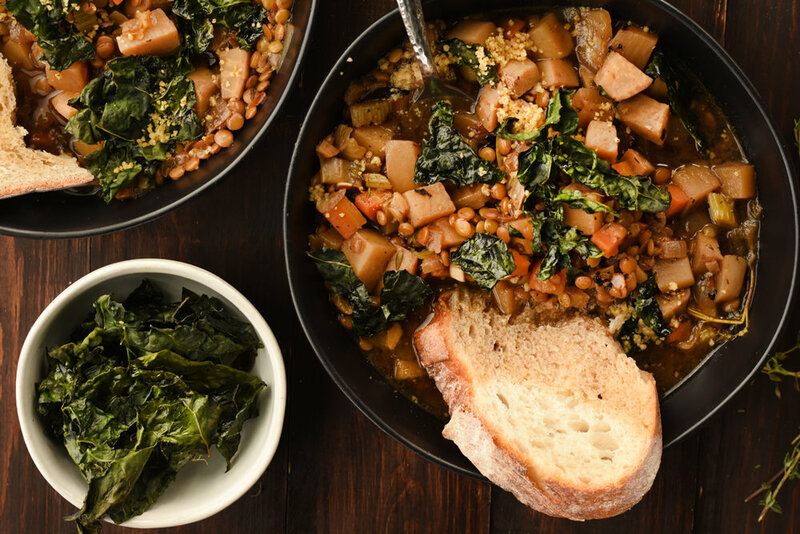 Lentils are a staple in our household. We use them in salads, “meat” loafs, bbq bowls, but most of all, we use them in soups. This particular one is unique in that we incorporated lots of hearty root veggies from our farmer’s market. 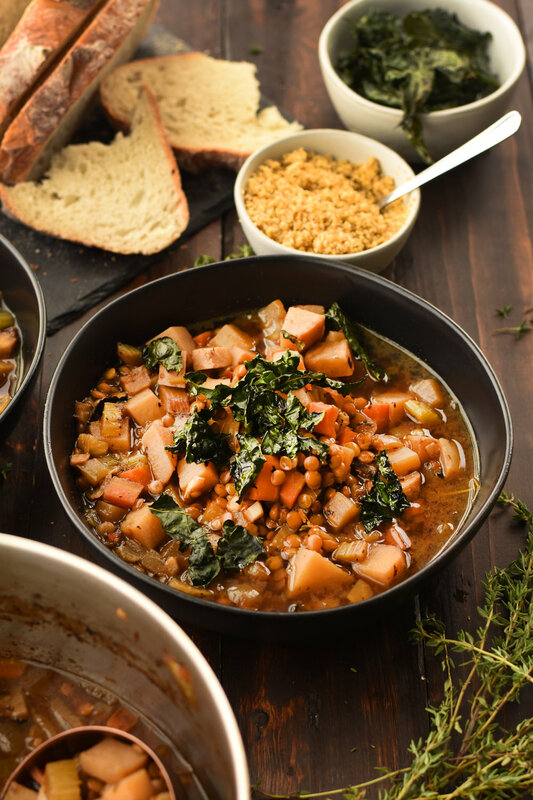 While this recipe may be labeled lentil soup, root vegetables are the real star of this dish. Starting off with the holy trinity of homestyle dishes, celery, carrots, and onions set the stage for this flavorful soup. Next up is a mirepoix of root vegetables: celery root, turnips, and potatoes. I forgot to put in parsnips, which would add a bit of creaminess to the texture. Feel free to add those in too. 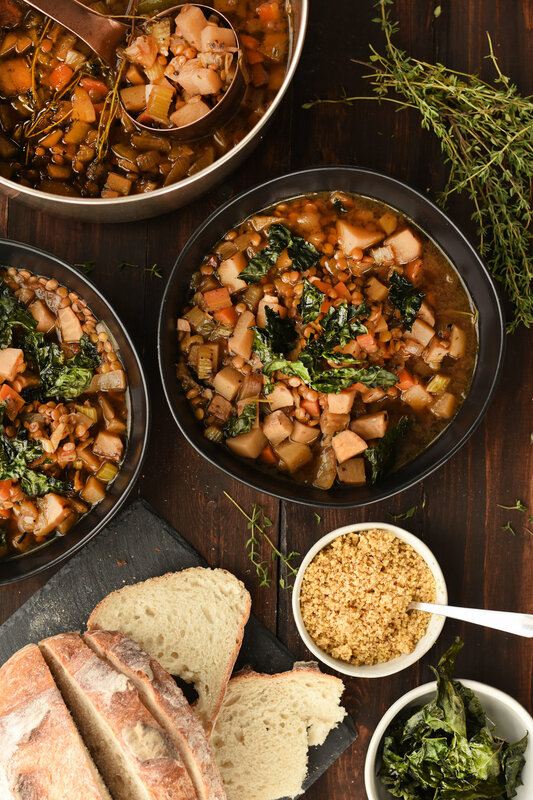 Lentils, fresh thyme, and homemade vegetable broth come next to marry all of the ingredients together. Next up is the crispy kale. While kale may be chock full of nutrients and phyto-something vitamins, I’m am most certain that this is not that kind of kale. Thinly sliced, doused in olive-oil and salt, then overly baked to crunchy perfection, this is purely for texture and does not count as 1 of your 6 servings of vegetables. But hey, it’s healthy(ish), right? Heat oil in a pan over medium heat. Add diced celery, onion, carrots, and fennel. Stir and cook until edges are browned, about 5-8 minutes. Add garlic and sauté for 30 seconds. Add cubed potato, turnip, and celery root. Stir to combine. Cook for an additional 5-8 minutes, until edges are browned. Add brown lentils, salt, pepper, red pepper flakes, thyme, vegetable broth, and water. Stir to combine. Bring to a boil, then let simmer for 40 minutes, or until lentils have softened. 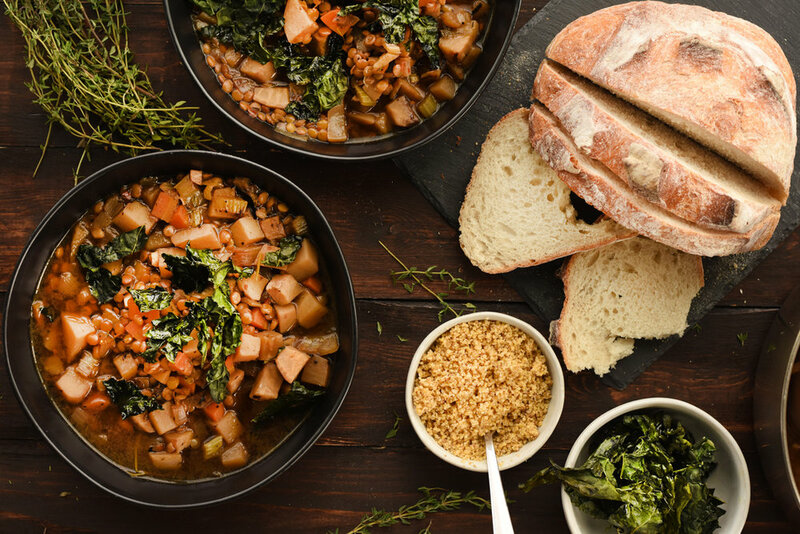 Serve with crispy kale and sough dough bread. Toss thinly sliced kale with olive oil and top with salt. Cook for 20 minutes or until kale is crispy.